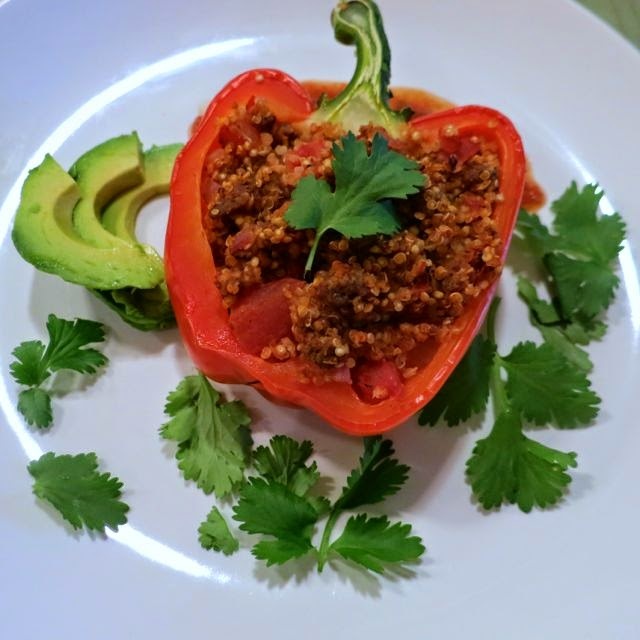 Who doesn't like stuffed peppers? Well, I for one love them because you can stuff them with whatever you'd like! 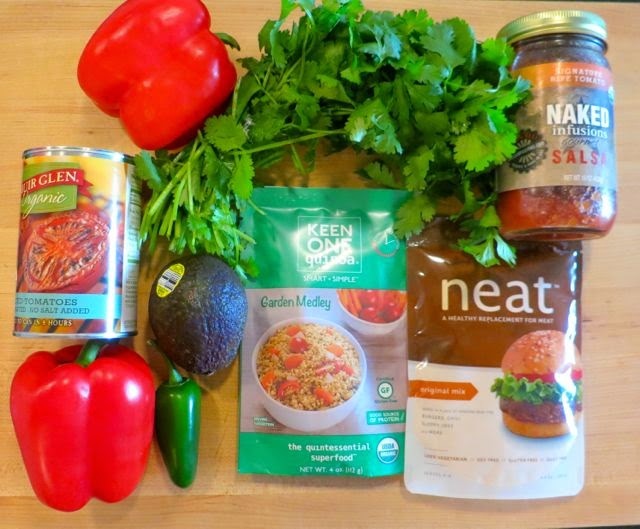 This recipe was inspired by some packages I just received from Keen One quinoa, and neat meat replacement. Keen One quinoa is packaged quinoa that comes with seasonings. So by using the Garden Medley flavor, I was able to infuse this meal with tomatoes, carrots, onions, garlic, and celery without any added spices. 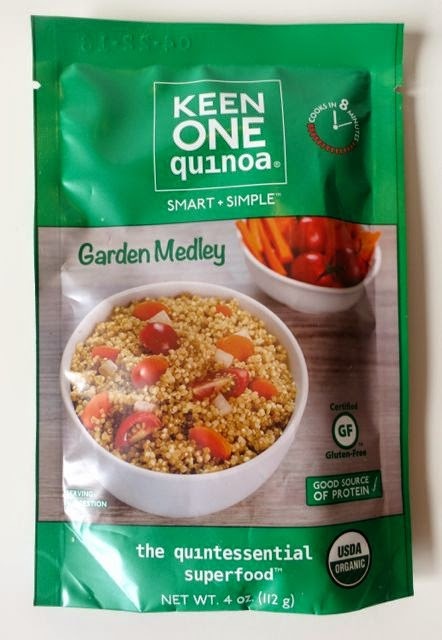 Keen One quinoa is certified gluten-free, certified organic, non-GMO, and vegan. 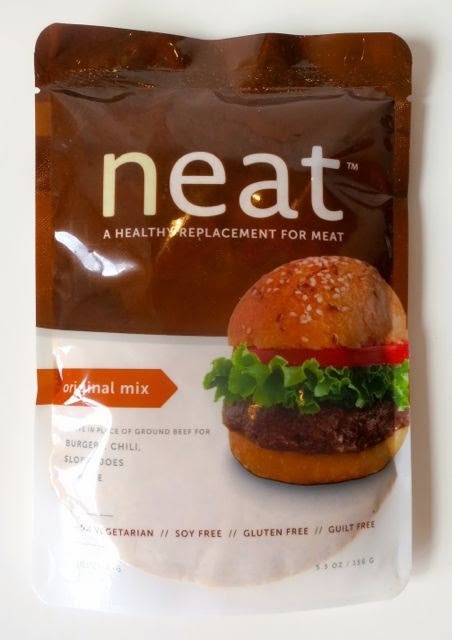 Neat is a new product on the market that is meant to serve the general population as a "meat replacement." 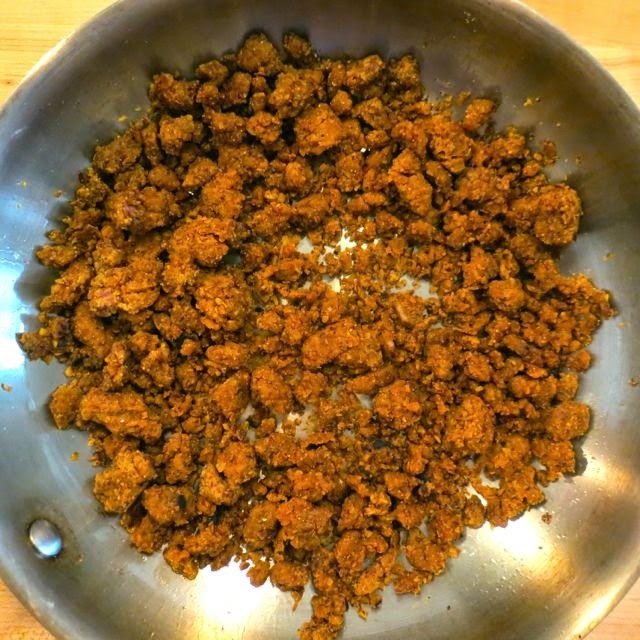 I used the Original Mix in this recipe, which is made of pecans, garbanzo beans, gluten free whole grain oats, whole grain cornmeal, sea salt, and spices. You basically mix the ground mix with egg replacer and water and saute and your have a crumbly ground beef-type mix. I liked the flavor, but found it a bit hard to work with as it was very sticky so it took a while for me to break it up into the crumbles I used in this dish. It also burned easily. I used more water than instructed on the package as the egg replacer is not as liquidy as an egg would be and their instructions call for real eggs. I really like the natural ingredients and the fact that that they are vegan, gluten-free, and non-GMO. 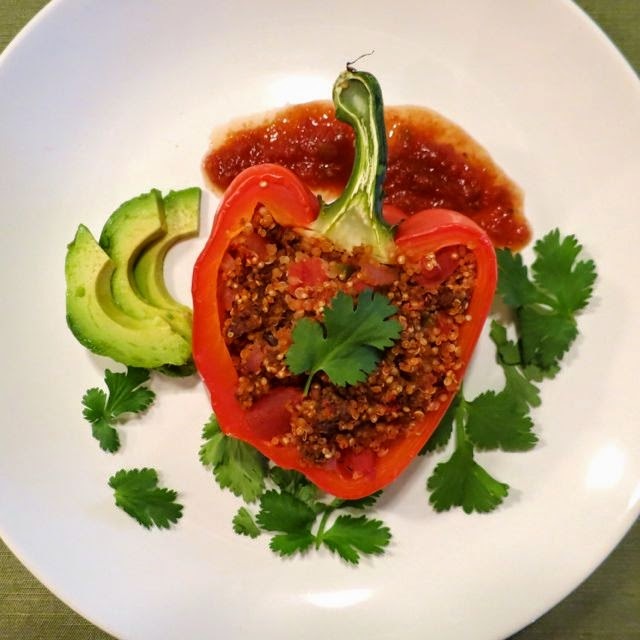 So think -- red peppers filled with seasoned quinoa, nut-based crumbles, and rich tomato salsa. This is another recipe that I'd call a crowd pleaser. Prepare quinoa as per directions on the package -- combine contents with 1 tsp olive oil and 1 cup of water. Bring to a boil, stir, then reduce heat to a simmer and cook for 7 minutes. Remove from heat and fluff. Prepare neat meat replacement by mixing it with the Ener-G egg replacer mix (already mixed with 4 Tbsp water) and add 4 more Tbsp of water. Note: the package states to use 2 Tbsp, but without using a real egg, I found the mix to be too dry so I doubled the water to 4 Tbsp. Mix with fork until all liquid is absorbed. Heat 2 Tbsp olive oil in skillet on medium heat. Drop small pieces of meat replacement into the skillet and allow it to cook for about 6 minutes, flipping regularly to avoid burning. Remove from heat. Bring a pot large enough to fit 4 whole bell peppers to boiling. Slice the bell peppers lengthwise through the stem. Remove the seeds by cutting them out carefully with a paring knife so as to leave the stem intact. Once the water is boiling, submerge them in the water for 5 minutes. Drain and blanch with cold water to stop them from cooking. 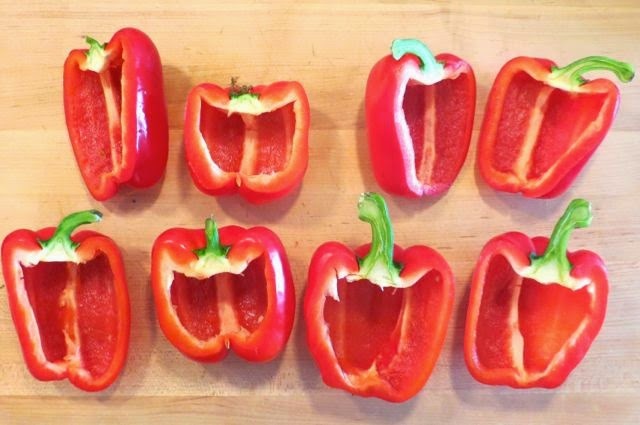 Set the peppers face down to allow them to dry. Add 1 Tbsp of olive oil to a saute pan on medium heat. Saute red onion and jalapeno pepper for 5 minutes. 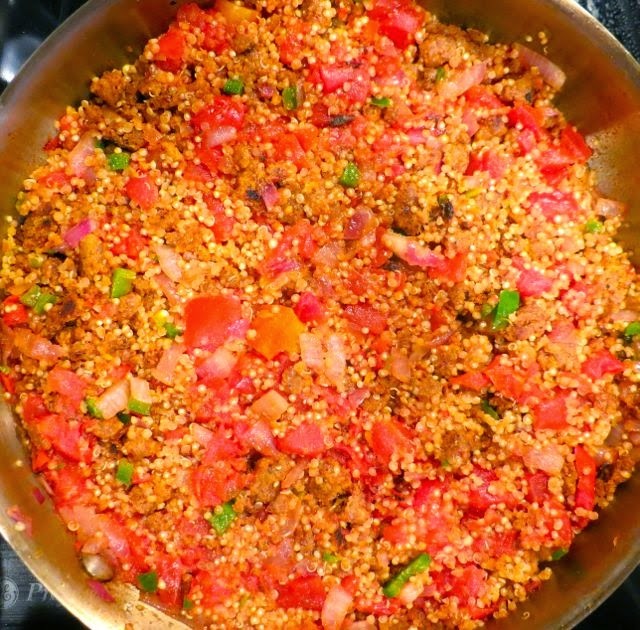 Then add quinoa, neat meat replacement, and tomatoes and cook, stirring regularly, for another 5 minutes. Add a pinch of sea salt, if desired. Preheat oven to 350-degrees Fahrenheit. Coat 1-2 glass dishes with cooking spray. Put the peppers in the dish(es). Scoop quinoa mix into each pepper allowing them to overflow a bit. Bake for 25 minutes. If desired, add vegan cheese on top during the final 5 minutes. Serve with cilantro, avocado slices, and salsa. Full Disclosure: Although the neat, quinoa, and salsa were provided to me for free to review, that in no way influenced my veracious opinion.